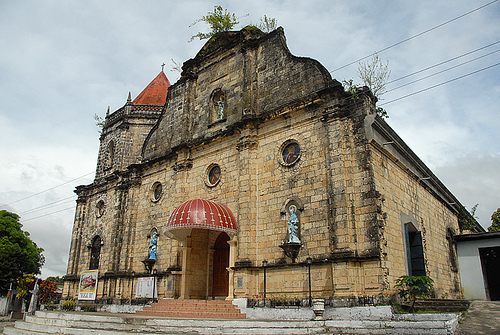 Iloilo is a hometown to many old churches and one of these is the Dingle Church, a peaceful town in Eastern Iloilo. Dingle Church is a Baroque architecture with its interiors showing features of the Neoclassical extravagance. The parish church of Saint John the Baptist is simple yet elegant. It is not lavishly adorned but it is a real beauty. Dingle Church, its main component is limestone and I find it unique. In this part of Iloilo, baked bricks is the most common material as seen in the churches of Miagao, San Joaquin, Cabatuan, Janiuay,and Santa Barbara. This church, limestone was quarried in the mountains of Bulabog-Putian which is now a national park. The Baroque architecture gold-like walls of the church stand out as well as its unique style. The church will remind us of pilgrim chapels in the Europe and Latin America where not much architectural details are used and there is not much emphasis on size which further appeals to a peaceful and serene atmosphere. Though the church was not built to outshine other neighboring temples, its simplicity always carries a certain charm that makes it a beautiful image to behold.